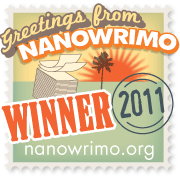 A year and a half ago I took on the National Novel Writing Contest, or NaNoWriMo as it is commonly known. The goal was to write 50,000 words in 30 days. At the end of the month, I had indeed met the challenge. Thank goodness, the challenge did not specify that we had to write 50,000 good words because I wrote 50,000 words of pure schlock. What that experience taught me was how darn hard it is to actually write a novel good enough to publish. Besides the obvious talent needed, it requires discipline and the willingness to write every day, even when the muse is not cooperating. That is why I am in awe of any of my fellow bloggers who have that kind of talent and dedication to become published. Q: What inspired you to write Desired to Death? A: I have always wanted to write a mystery (I’ve always loved reading them), and I’d played around with different amateur sleuth ideas. I liked the idea of a woman who was “used up” in life, someone who felt like she had nothing else going for her, and when I myself had days of feeling that way—after my kids left for college—I decided I could really relate to that woman’s feelings and could see what would inspire her to solve mysteries large and small. Q: How are you like Maggie, your main character, and how are you different? A: Warning, this answer may contain minor spoilers! Maggie and I are similar in our interest in mysteries (I’ve followed many a car, let me tell you!) and trusting our intuition and also in our tendency to sarcasm. We also both have two children (a boy and a girl) and wonderful husbands in a long-term committed relationship. I think Maggie is much more outgoing than I am, cares more about her standing and connections in the community, and she’s also a lot braver. I would never invite a stranger to stay in my home (like Maggie does). I would never speak to a loan shark or go and meet with someone I thought was a killer. Also, I’ve never been to a fortune teller (I never would go). Q: While writing Desired to Death, did you ever worry that you were being too autobiographical, that you were imbuing Maggie with too many of your emotions rather than letting her develop her own persona? A: First and foremost, Maggie is a fictional character, so I guess I didn’t worry too much about being too autobiographical. Yes, we have similarities, most of them around our empty nest experiences, but Maggie and I are very different in many ways as well. I’ve never known a murderer (okay, that’s not true, I once met someone at Home Depot that I found out later was later in prison for murdering someone). I’ve never owned a chocolate lab. I’ve never been married to someone who was a pilot (well, that also is not quite true, my husband is a private plane pilot). I don’t have kids named Hank and Jessica (although when we first got married, that’s what we planned to name our kids). So, never mind, apparently I’m the fictional character and Maggie is really Julia Munroe Martin, or should I say J.M. Maison! 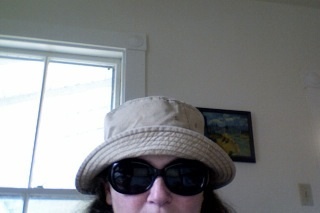 Q: This novel begins Maggie’s career as an amateur sleuth. How do you see her changing as the series progresses? A: I think Maggie will become even more bold in her mystery solving, but I need to be careful to balance that because part of the premise of this series is that Maggie really is a newbie, not sure what she’s doing, and is also doing it because she has nothing else that fulfills her. If I fulfill her too much with the mystery solving, then her personality will begin to change… does that make sense? I also see Maggie solving some mysteries outside of Halfway Bay, Maine. Q: What did you learn from writing Desired to Death? A: How many steps there are to finish, really finish, writing a book, especially one that will be self-published. The book went through at least two extensive outlines, more than eight drafts, beta readers, an editor, a proofreader, and countless read-alouds to my incredibly patient and supportive husband (who never complained even once, although he did fall asleep a few times when I was reading something for the zillionth time!). Q: What did you find the most challenging when writing this book? A: Keeping the characters straight in my mind, making sure that the continuity and consistency flowed from scene to scene. This is the most difficult part of writing a mystery, in my mind. Q: Describe your schedule for a typical day of writing. Or do you even have typical days? A: I always write first thing in the morning. By 8:30, at the latest, I’m sitting in front of the computer writing. I usually write from 8:30 to noon and when I’m on a roll (which is most of the time, these days) I write all afternoon, too. If I’m working on the business side of self-publishing, I do that in the afternoon in place of writing. Little known fact…I have a certain song I listen to that will immediately get me into “the writing zone,” and if I listen to that, I can write at any time of day. A: I’m in the second draft of a historical time travel novel. Q: What question have you always wanted to be asked in an interview? How would you answer it? A: This is only my fourth interview ever (well, about writing), so this was a tough (but good!) question. I really liked your question about how Maggie and I are similar and different. But, today I think I’ll say: “What was the weirdest job you ever had (other than writing)?” Answer: Squid cleaner. I’m looking forward to reading the next book in this series. I’d also love to know what song got Julia writing every day and kept her writing. I could use that song! You can purchase a copy of Julia’s book by clicking on this link to Amazon. Julia is also offering one free copy to someone whose name will be randomly drawn from the comments I receive on this post through Monday. This entry was posted in Just Blogging and tagged blogging, Murder mysteries, NaNoWriMo, Publishing, Writing. Bookmark the permalink. I started Desired to Death this weekend. I finished Desired to Death this weekend. It was such a fun read! I love mysteries and I love feel-good stories and books that keep me feeling suspenseful but aren’t gory and this was everything I like in a good, fun, read with characters that stick with you. Yay! Go Julia! I’m glad you enjoyed it, Julie!! Loved, loved, LOVED the book! I could see the similarities in what I imagine is Julia’s hometown….that and her amazing, super-hero hubby! I enjoyed the book from the first page to the last! It was a gripping, fun, page-turner and I can’t wait to see what shenanigans Maggie True gets herself into next! I agree that it was a page-turner, Ann. I was bummed when it was over! LOVED this interview (and have read Desired to Death as well – loved it, Susan). Squid cleaner? Now that is something I did NOT know. I love hearing you talk about your similarities to Maggie (and suspected some of it as I was reading!). What a wonderful ride you’re on, Julia. I’m so happy to have been able to read and play a small part. So glad you enjoyed the interview, Melissa! As for squid cleaner, I was sure I’d shared (overshared) that story… so glad to hear it’s a new one!! Thanks for all you support, Melissa! Thanks for the interview. I am always on the look for intriguin murder mysteries. This one sounds great! Eventually I will have to break down and get a kindle or some other portable device for reading in bed at night–my usual routine. I hope you do get one of those devices and read Julia’s novel. The Kindle is very reasonable. As an English teacher and lover of books, I didn’t think I would ever want an e-reader, but when I got my Nook, I was completely hooked. I realized it’s literature I love. So glad it sounds good to you, Patti! It will be available on amazon in paperback later this month! Thanks for your comment (and I agree with Susan, I resisted buying one but now I love my Kindle!). Great interview Susan! I admire both of you, life has gotten in the way of writing and the muse seems to be on an extended European tour (wish I’d gone with her). I think I’ll try downloading that song also, I also am intrigued by the 2nd novel in the works. Thanks for the opportunity to be introduced to Julia (J). I have really missed your writing, Carol. Every time I order something from L.L. bean, I keep hoping that you will answer the phone. Yes, that time travel novel has me excited, too. Glad you enjoyed it, Carol, and it’s nice to meet you, too! Hope you enjoy Desired to Death and the It Will Rain song… I can’t promise it will have the desired affect on everyone (it’s very tied in — at least in my mind — to my current novel in progress!). Again, nice to meet you! Had to come back after looking at your blog, Carol — I didn’t realize you live in Maine — me too! Great interview, Susan! 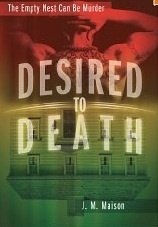 I’m an avid mystery reader like Julia and I loved Desired to Death. Maggie is a likeable and believable heroine with a great supporting cast as well as an intriguing pool of suspects. Well done, Julia! How wonderful, Shary, that you’ve already read it! Just got the Kindle sample. Yay, HG! I love the characters of Maggie and her husband. Don’t usually find such loving relationships in novels! Thank you, Huffygirl! Hope you enjoy it! I truly admire Julia and those of you who turn a dream into a reality. Yes, Al. You stole from me! I’ll talk to my lawyer. THANK YOU, Susan!! This was such a fun interview, but more than that, I am so very humbled by your kind words. Thank you! As for the song, I will tell you (please don’t judge), it’s the theme song from Twilight! !… It Will Rain by Bruno Mars. Six weeks? I’m going to drive by every day to see if you’re writing! 😉 Thanks to you and Julia for taking the time to share her writing secret…and her new book. Squid cleaner? I don’t even want to know! Um…maybe I exaggerated, Patti. I think it will take me at least eight weeks…or more. And please don’t come by to check up on me. I wouldn’t want you to interrupt me while I’m busy writing.